“IEEE Bombay Section Symposia (IBSS)” are slated to be one of the main Signature events of Bombay Section. Aim of this annual event is to provide its members with a platform to share their expertise in a wide range of science, engineering and industrial research areas that the IEEE ably represents and nurtures. At the same time, the Symposia will offer excellent opportunities for the students, researchers and industries to foster collaborations or simply to further their knowledge in the cutting-edge science, engineering and technology. It is strongly envisaged that the Symposia will establish thought leadership, advocating compelling research ideas for the betterment of society and benefit to the local communities. Finally since this is a proposed Symposium series, it will naturally facilitate continuity from proposals to their implementation over years. 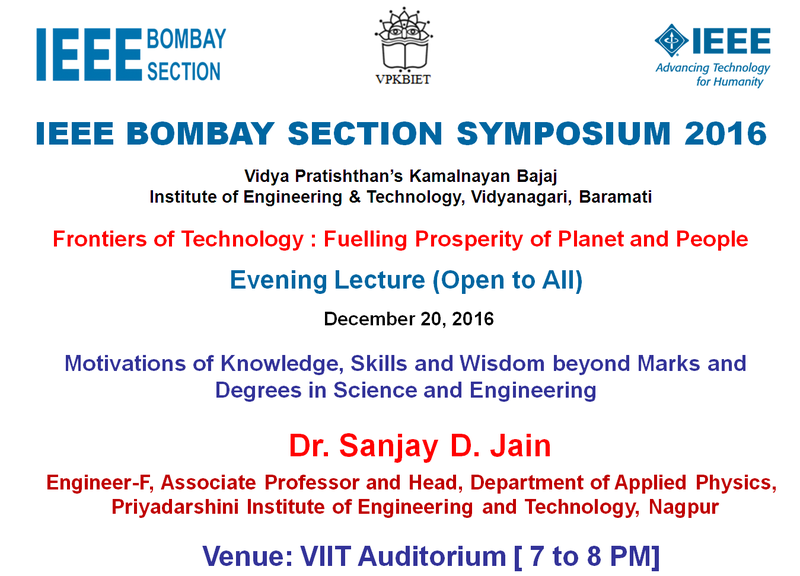 Second Edition of IEEE Bombay Section Symposium (IBSS-2016) will be held during 21-22 December 2016 at Vidya Pratishthan’s Kamalnayan Bajaj Institute of Engineering & Technology, Baramati. (Map) The Symposium will be a mix of invited Review talks (by experts in the chosen topics of the Symposium), invited Technical presentations and Contributory Posters. Posters will be displayed along with Plenary sessions, but specific time slot will be allotted for delegates to go around the posters and interact with the contributors. All presented Posters will be published in IEEExplore. Prizes will be announced for best Posters. Product exhibitions/posters/demos by the industry will be encouraged as this activity serves the purpose of adding technical value to the Symposium.